Pop, tilt, wrap, prop, collapse, grip, repeat - PopSockets are great for enhancing the grip and capabilities of your phone. Secure grips for texting, calling, photos, and selfies - compatible with all smartphones and tablets. Works in landscape and portrait modes for watching videos, web surfing, texting, gaming, group photos, FaceTime, and Skype. Allows your hand to relax while securely holding your phone - never drop your phone again from lost grip. Advanced reusable adhesive - repositionable, washable adhesive sticks to most devices and cases (will not stick to some waterproof cases or silicone). What Are PopSockets? PopSockets are expanding grips and stands that attach to most phones, tablets, and cases. Add a single PopSocket, or a pair of PopSockets, to the back of almost any mobile device to transform its capabilities. PopSockets "pop" whenever you need a grip, a stand, an earbud-management system, or just something to play with. Remove your PopSocket by pulling slowly on the base; you can reposition and reattach time and time again. You&apos;ll always have the exact grip or stand you need. PopSockets not only make terrific phone grips and phone stands, they also make holding tablets and e-readers more comfortable and secure. Whether you place PopSockets on your Nintendo 3DS for gaming, your GoPro for a supplemental grip in the water, or on your bedroom mirror to hang jewelry, the possibilities are endless. If you attach two PopSockets to your device you now have a convenient earbud-management system. Simply wrap the cord around the two PopSockets, and voila! No more tangly mess to deal with. Never Lose Grip on Your Phone or Tablet Again! Click "Add to Cart" now to get your PopSocket expanding grip and stand. Add a single PopSocket, or a pair of PopSockets, to the back of almost any mobile device to transform its capabilities. 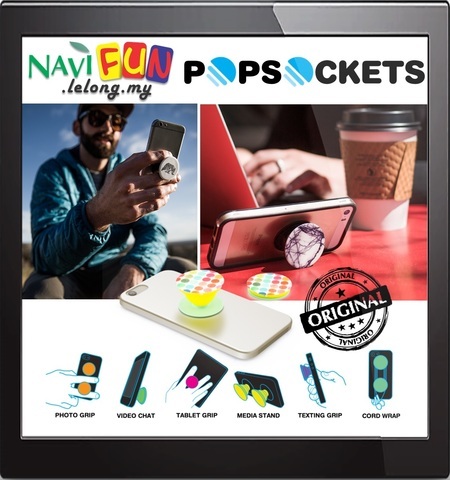 PopSockets "pop" whenever you need a grip, a stand, an earbud-management system, or just something to play with. PopSockets not only make terrific phone grips and phone stands, they also make holding tablets and e-readers more comfortable and secure. While PopSockets do not stick to all devices and cases -- especially those made of silicone or with a waterproofing coating -- they do stick to most typical devices and cases. And with the PopClip companion product, they mount to nearly any vertical surface, including dashboards, mirrors, bed posts, refrigerators, and walls, for convenient hands-free viewing. Whether you place PopSockets on your Nintendo 3DS for gaming, your GoPro for a supplemental grip in the water, or on your bedroom mirror to hang jewelry, the possibilities are endless. Where do you put your PopSockets? Let us know on Facebook, Instagram, or Twitter. What will my PopSocket stick to? PopSockets adhere to most phones, tablets, and cases. They sometimes have trouble sticking to silicone, leather, and waterproof cases, as well as some highly textured cases. How many times can I stick and re-stick my PopSocket? Over 100 times to a phone; only once to a cat. You can rinse your sticky gel with water if it gets dirty and loses its sticking power. Let it completely dry, but don&apos;t leave it unattached to a surface for more than an hour or it might lose its power forever. How many times can I expand and collapse my PopSocket? PopSockets are designed to expand and collapse 12,000 times. Where should I position my PopSocket on my phone? It&apos;s up to you! Some people like it high, some people like it low; some people like two PopSockets on their phone; some people like moving their one PopSocket around depending on their whims. If you are having trouble using your PopSocket as a stand, move the PopSocket closer to the edge of your phone. What if my accordion detaches from the base? ﻿Wow, you sure are strong! Don&apos;t worry, your PopSocket is not broken; PopSockets are designed to detach. Please watch our instructional YouTube video here. What if my PopSocket won&apos;t stick? ﻿The PopSocket adhesive is designed to stick to most materials, but has difficulty with some silicone and waterproof coatings. Try adhering your PopSocket directly to your phone to see whether the sticky gel is working properly -- if it doesn&apos;t stick to your phone, the gel is not working properly. In this case, you should rinse the base of your PopSocket with water. Let it completely dry, but don&apos;t leave it unattached to a surface for more than an hour or it might lose its power forever. What are PopSockets made of? Polycarbonate, TPU, and polyurethane. Custom PopSockets also contain PBT. What are the dimensions of the PopClip? ﻿1.9" x 1.6" x .4"
The part of the PopClip that attaches to surfaces is about the size of a quarter (.9" diameter). Can I move my PopClip from one place to another? ﻿Unlike the PopSocket, the PopClip is designed for one-time adhesion. Your PopClip comes with an extra VHB adhesive for repositioning.